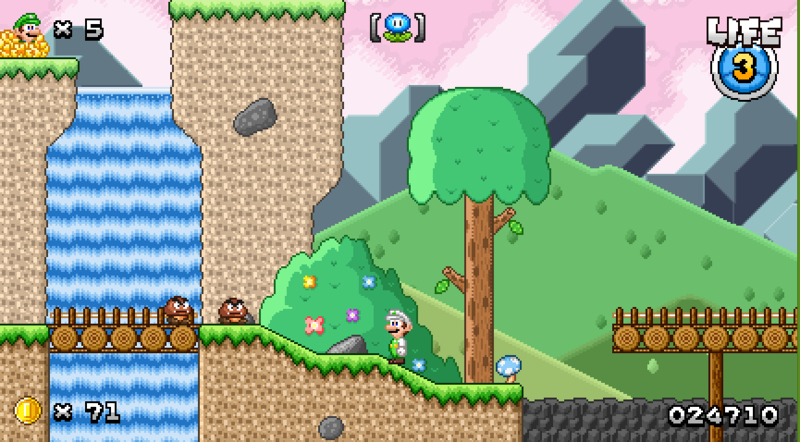 Power Star Frenzy is a 2D platformer aimed at bring back to good old days of Mario with a few new twists! This game features SMB, SM64, SMS, and SMG style gameplay, made using DragzeeY Engine 7! This game was created using Gamemaker 8.1, but a GameMaker Studio port is being worked on as you read this! But this port will also be somewhat of a semi restart in a way. Since everything is getting upgraded and I'm using a new engine. This engine was also created by Gatete the one that made PSF's original engine. So many new features will be coming soon! - Bug fixes and a bunch of other stuff! - Every single level from the previous demos were completely re-designed. - Instead of 15 stars there is 60 to collect in this demo. - Every World map has also been completely re-designed. - Added Jumping and 8 directional movement to the world map. - Item Blocks now appear on the mapscreen. - Luigi is now a playable character! - NEW Levelscreen HUD AGAIN. - NEW Mapscreen HUD AGAIN. - A tutorial level was added. - Mystery Boxes have been added to every level. - Brand new Multiplayer Battle Mode has been added! - Added the GroundPound to both bros.
- Longer levels and still with all the fun. - Star Coins, Chaos Crystals, and Chaos Events were added. - Nicer menus for the eyes to look at and enjoy. - Simple effects have been added to many things to give the game some charm. - Added New Stars to every level and replaced many. - When collecting a star you now can see stats and can get bonuses! - Added 3 other mini worlds to check out. - You can now enter houses in Toad Town. - Quiz Toads also appear in some levels. - You can run on slopes properly now. - Secret stars have been added to both levels, and other places. - Many new effects have been added like glowing objects, etc. - New enemies have been added to the game. - Complete physics overhall for the players. - Fixed numerous collisions with enemies. - Loading screen was changed as well. - The game will now auto save your progress. - Updated enemy sprites so they look better. - Updated many other sprites to fit with the game more. 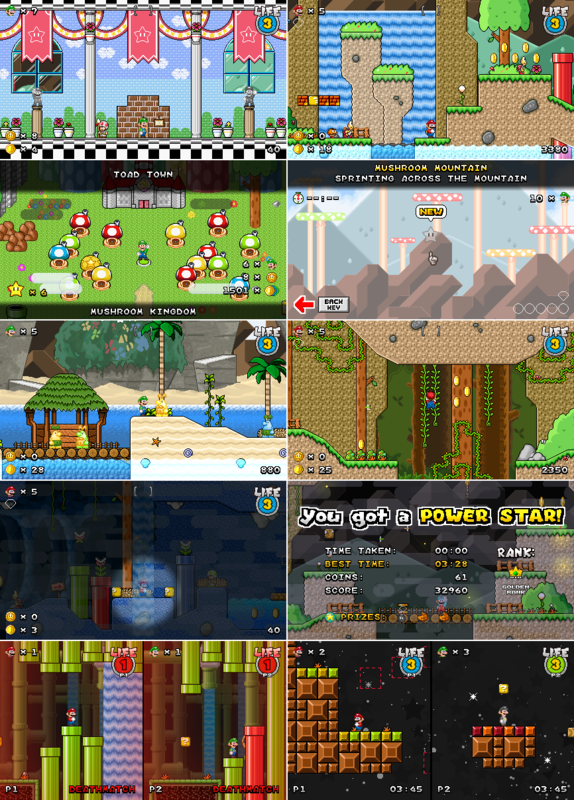 - Propeller Mushroom, Laser Mushroom, Super Bomb, and Super Flower have been added. - Added more live decor like butterflies, birds, and dragonflies. - Fixed TONS AND TONS AND TONS of bugs. - No more data index does not exist bug. - Voices were added and are toggleable. - Better Star Select menu and look. - Gamepad Support was added only X-Input at the moment. - Many other more editions you can see if you download the game! - Guarteed enjoyment to the player. I'm just a random guy named Nick! I like to make games, program, design sprites/art, and play Nintendo games. 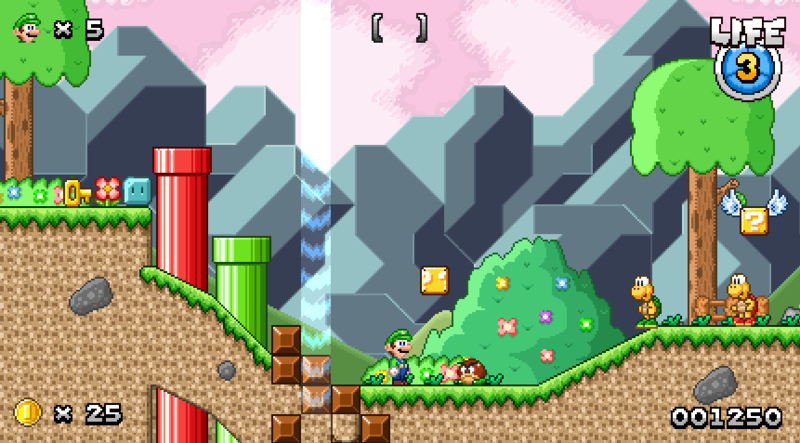 Check out my cool fangame: SUPER MARIO Power Star Frenzy! A twist to the collectathon style Mario games. Will V1.1.0 Save Files be compatible with the final version? I don't want to play it half way thought and then have to play it again. I hope the new version plays like the one we got. Pikaspray Yellow did a video on your game! but you might already know that. It's cool how far this game is going to implement both 3D and 2D elements of a Mario game, together. This game is so flipping impressive. Looking forward to this when its complete! (11-28-2017, 07:23 AM)Minerador Slime Will V1.1.0 Save Files be compatible with the final version? I don't want to play it half way thought and then have to play it again. Sadly they won't since PSF is getting ported over to GameMaker Studio where the file handling is significantly different than GameMaker 8.1, but the game will be much different as well, so it won't feel like you'll have to do everything once again. (12-01-2017, 12:51 PM)RetroRespecter I hope the new version plays like the one we got. It will, of course! Just much smoother and better to control! (12-01-2017, 01:41 PM)YoshisIsland3 Pikaspray Yellow did a video on your game! but you might already know that. It's cool how far this game is going to implement both 3D and 2D elements of a Mario game, together. Pikaspray is really one cool guy for making such a very informative video on PSF, I'm really happy he enjoyed it so much! But now even though v1.1.0 was released not too long ago, the new port just looks and feels so much better compared to the original for now. (12-11-2017, 06:02 PM)xcyper33 This game is so flipping impressive. Looking forward to this when its complete! Really happy to hear so! It's gonna take a while to get the whole game ported over to GameMaker Studio, but I'll be sure to release more demos along the way, so stay tuned! I've made a lot of progress on the PSF Studio port, and have been showing it off on GameJolt, the Discord Server, and Twitter, but not really here. I didn't even post the new demo to the MFGG mainsite. Kinda started to move away from MFGG. But if anyone is interested here are some gifs of the GameMaker Studio port. This is also the original Waterfall Walkway area, but the main section is going to be remade, this is acting as more of a testing level right now. Just by looking at the .gifs, I can tell the controls feel a lot more like Super Mario World, and the hitboxes have seen a massive improvement. This is looking awesome, my dude. Wow! That is a lot of progress. Aside from the Super Mario World styled Mario and Luigi sprites, this game is looking awesome! Really looking forward to all the game nights I'll be having with my friends on the multiplayer mode! If you'll be adding more moves like the long jump, and that only increases the hype levels I am currently experiencing. I wish I could help you out with some custom Mario and Luigi sprites that'd fit the game, but you've made it clear that you are keeping those SMW ones. It's not that they look bad, they just look a tad out of place in a game with SMB3 styled tiles and NPC's. I think the main reason for that is they don't have black outlines around them like everything else in the game. Anyway, I'm sorry to hear about the fate of your game, @Random.NICK. It looked so polished and had some cool stuff that you don't see too often in fangames, such as co-op. But I can understand, though; it's easy to dream about doing the biggest fangame ever, but much harder to actually do it, especially when you're doing it by yourself. In the future, I'd suggest focusing on the main things in a game (such as the adventure), then polish it up and add some nice-to-have features (like online play) once the fundamentals are done. If it's becoming too big and a lot of work, then it might be a good idea to consider scaling it down and cut off some of the fat (my Battle in the Future game, for example, was going to have many bosses, but I ended up only doing a tutorial boss and a final boss, since I felt that it's taking me long enough to do just a couple and just decided to get the main stuff done). I'm looking forward to seeing the final demo, though. It's nice that you're at least letting us experience what's left in the game. Who knows, maybe someday you'll feel like you want to get back on fangaming after taking a break from it and continue this project. By the way, good luck on your college studies, and I'm sure it'll be interesting to see what you come up with for indie games!